When we adopted our sib group of four, the two youngers were together in one foster home and the two older ones were together in another home. This type of arrangement can be most difficult on the oldest because they feel a need to protect their younger siblings. How do they do that when they don’t live together and only see each other at weekly visits? This was the case with our kids. The oldest was 9 years old and very aware of his family situation. Not only did it affect his outlook on life, but having three younger siblings also in a temporary family situation was a huge stressor for him. It’s important to learn all you can about the time before you take them into your home because their prior experiences will affect how they adjust to your family. In our case, the younger two had spent most of their lives in foster care, so they had a predisposed thought process that would follow them for months. Those two thought family was temporary. They were 2 1/2 and 3 1/2 when they moved in – from foster care. The first time we went to visit them in the foster care workers meeting room, I came home totally freaked out because of their hyper, out of control behavior during the visit. I was wondering if we were biting off more than we could chew. I was scared to death of a two and three year old! Once they moved in we had bouts of screaming, fighting and hitting. BUT, they were also adorable, sweet and smart! We were at a store just after they moved in and the three year old hit our 10 year old son in the stomach causing him to drop to his knees – he had knocked the wind out of him! We later found out the foster mom had taught the little boys to box because she feared they might one day have to move back home and she wanted them to be able to defend themselves. We had a three year old Muhammed Ali! Understanding and coping with behavior. Within a day or so we had to stand the three year old in the corner for a time out because he was being a bully to the other kids. He stood there and screamed “I’m so maaaad!” His 9 year old brother came out and stood there watching to see how I would respond – he was in big brother protection mode. If I had not known the 3 year old’s “therapist” had taught him to express himself in words, “I’m so maaaad!” I would have been concerned about his temper. But since I knew a bit about them and their past experiences, I knew hoped that eventually we’d win them over and be able to redirect them, teaching them self control, kindness and patience. We also realized that the older brother was exhibiting concern for how I might react – based on past experiences with the adults in his life. Once he was confident that I deal with his little bro fairly and kindly, he was able trust me enough to go on about his playing without concern for his younger siblings. These kids have had experiences very different from us and had developed a distrust and fear of adults. The two youngers had moved foster homes every six months so when our six month anniversary for their move in to our home came around, they asked for a suitcase and wanted to know where they would live next. No, they didn’t have a calendar that they checked off and counted the days, they just had an internal clock that told them to prepare to move on. I could not convince them that they were staying with us forever. They didn’t understand the concept of staying with the same mom and dad more than 6 months. They hadn’t experienced what it meant to belong to a family. Their internal clock took them over and told them it was time to move on. When dealing with kids who have had a background different from ours, we need to find out as much as possible and use that information to temper our expectations. Where are all my forks? The first week the four were in our home we discovered some of our silverware was missing. It took us a few days to figure out what happened to them. The two younger boys were throwing them away because they’d never had metal silverware – they always had plastic ware and threw them away after each meal. The smallest things can be a real eye opener. We need to be the light in their darkness. Every day living shapes kids’ minds – not every child has been fortunate enough to start out in a stable living situation. 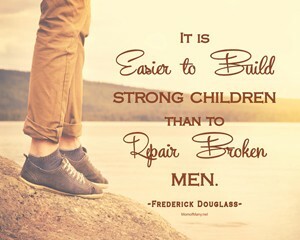 Can you imagine how abuse and neglect can plant negative thoughts into a kids’ mind growing up? How does a child understand, trust or even desire to have a mom and dad if they’ve never had one? To some, the adults that are in charge are their enemy. It wasn’t until years after we adopted some of our kids that we found out about the abuse that went on prior to adoption. It’s no wonder they mistrusted and even hated us. Some still do because they never learned to love or trust. We tried our best to instill the love of family, but some never got it, though we hope that one day God will change their hearts. When dealing with their out of control behavior, it’s very difficult to win their hearts. When our sibship of 3 moved in at ages 1 1/2, 2 1/2, and 3 1/2 as foster kids, (adopted 3 years later) I kept a record one day of how often I had to intervene or correct them. It averaged out to every 3 minutes. It can be very challenging to insert warm, loving moments into a day like that! Add eating disorders, learning difficulties, nightmares and fears, oppositional behavior, etc. and you have issues that can make bonding very difficult for the child AND parent. We tried to be understanding and adjust our expectations based on our kids’ experiences before adoption, but we never allowed that to be used as an excuse for misbehavior either. We taught them and insisted on a better way and even if they didn’t accept our way of thinking and were disobedient or oppositional, at least they knew what was right and would know where to find the light when they were tired of living in the darkness. You can’t always control a child’s actions or reactions, to always be obedient and respectful, but you can make them regret their choices. Each parent must get to know their child and tailor their teaching and discipline to meet their needs. They have a need to learn to respect authority, prefer others, and learn proper behavior. As parents, we do what is necessary to show them the light and be the example they can draw from when they do desire to live properly. Not everyone will understand or agree. You will find some who are critical and accuse you of not being fair to your kids, but you still must decide what is right and follow through. They won’t have to answer for your parenting, you will. So do your best to train them, meet their needs and tailor your discipline to their personality and abilities. You might even have children who think you were abusive or evil because you insisted on proper behavior and disciplined them for disobedience. They only remember the pain of the discipline, not what they did to warrant it. To be able to pillow your head at night and have no regrets, you need to decide what is best and follow through. Parenting isn’t a popularity contest – with others outside your family or your kids. Parenting is deciding what is best for your kids and insisting on it. If you don’t, they will not learn how to live in society or hear God’s voice. Both are paramount to a successful life. God calls us to be faithful and that is what we must do – regardless. Then we let Him deal with the rest.